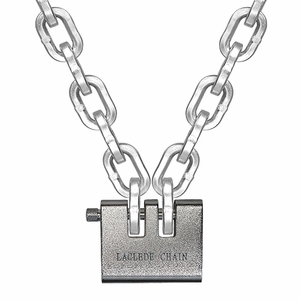 This is Laclede's take on a security chain, which they call "Lockdown Chain". It sells extremely well, and since Laclede changed their heat treating process to make this chain even harder--62-65 HRC--we are confident it's going to sell better than ever! 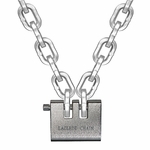 Lockdown Chain used to be thru-hardened but with a lower HRC rating. Laclede's design team determined their chain would be even tougher to cut being case-hardened yet with a much higher HRC rating. They brought this change to market quickly, and now have a security chain that stacks up against ANY competitor. At 1/2" (13mm) in diameter, it is the biggest, beefiest security chain we offer. Made from quenched and tempered alloy steel with an electro-galvanized finish.